Ben Barkow, the director of the Wiener Library, reported in 2010 that “numerous websites cite a made-up quotation by the Library stating that Chesterton was not antisemitic. 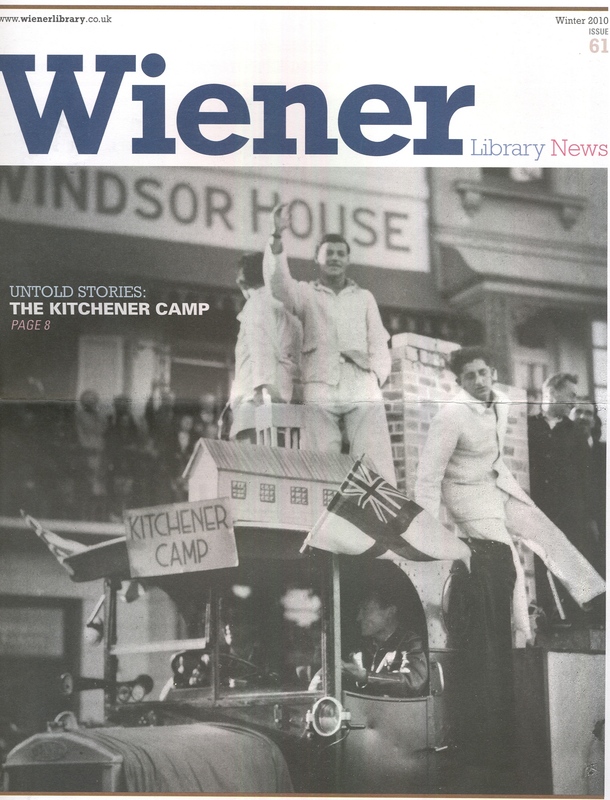 Our efforts to have these false attributions removed have largely failed.” The same issue of the Wiener Library News contained a short report (by the present author) on this Wiener Library Defence. The myth that the Wiener Library defended Chesterton has been recycled in a number of books, newspapers, and periodicals as if it was established truth. Joseph Pearce reproduced Coren’s defence in his own biography of Chesterton published in 1996. Aidan Mackey referred to it in a letter to the editor of the Jewish Chronicle in 1997. Ian Boyd, editor of The Chesterton Review and president of the G. K. Chesterton Institute for Faith and Culture, and Stratford Caldecott, chairman of the journal Second Spring, have also referred to it in more recent statements denying Chesterton’s antisemitism. William Oddie’s essay on the so-called “philosemitism” of Chesterton also cites the Wiener Library defence. The resilience of this myth is demonstrated by the fact that there are still numerous internet pages that refer to it. Update (6 September 2013): In response to a request to cite his source for the statement attributed to the Weiner Library, Michael Coren stated in a twitter posting to @Barthsnotes and @OliverKamm (Oliver Kamm) on 2 September: “Conducted interview in 86, with the librarian there who spent the morning with me. 27 yrs ago. No idea of his name.” This would suggest that at best the reported views were the personal sentiments of one of the many librarians who have worked at the Wiener Library but were unauthorised to speak officially on the Library’s behalf, rather than the Wiener Library itself. It is of course impossible to verify without a name – and indeed, it may be reasonably asked why the librarian’s name was not collected and cited at the time. Update (23 September 2013): In an online article published on 13 September, Coren stated that he discussed his research with a librarian at the Wiener Library but that he has “no name” and “no proof” as it was a quarter of a century ago. This episode is discussed in “Ludicrous, surreal” defence of G. K. Chesterton“. 1. Michael Coren, “Just bad friends,” review of G. K. Chesterton, by Michael Ffinch, New Statesman, 8 August 1986, 30. 2. Michael Coren, Gilbert: The Man Who was G. K. Chesterton (London: Jonathan Cape, 1989), 209-210. 3. Email to author from Michael Annegarn, Wiener Library (approved by Ben Barkow, Director of the Wiener Library), 22 March 2010. 4. 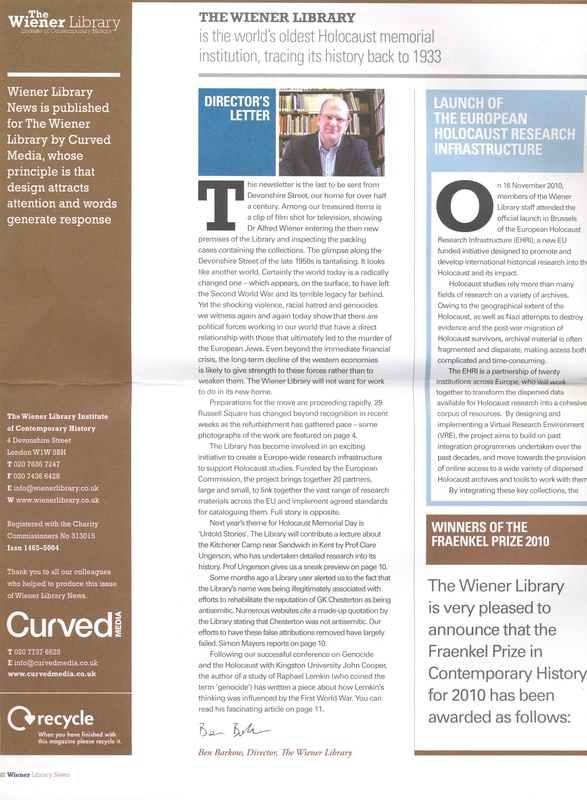 Ben Barkow, “Director’s Letter,” Wiener Library News, Winter 2010, 2. 5. Simon Mayers, “G. 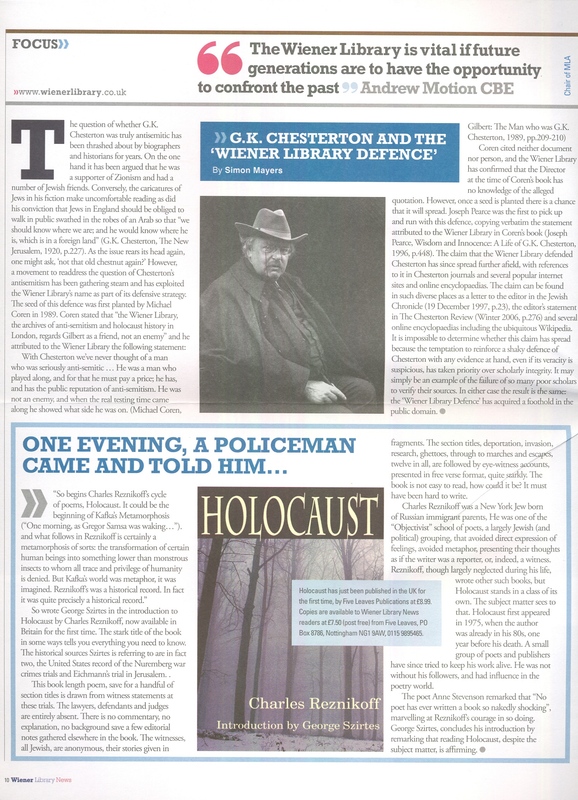 K. Chesterton and the Wiener Library Defence,” Wiener Library News, Winter 2010, 10. 6. “Christian Conscience on Trial,” Wiener Library Bulletin XVII, no. 4 (October 1963), 1. 7. Joseph Pearce, Wisdom and Innocence: A Life of G. K. Chesterton (London: Hodder and Stoughton, 1996), 448. 8. Aidan Mackey, “Chesterton: Case for the defence,” Jewish Chronicle, 19 December 1997, 23. 9. See Ian Boyd, “Introduction,” Chesterton Review XXXII, no. 3&4 (Winter 2006), 276; Ian Boyd, Stratford Caldecott and Aidan Mackey, “Chesterton’s alleged ‘anti-Semitism,’” http://www.secondspring.co.uk/spring/semitism11.htm (downloaded 1 May 2013). 10. William Oddie, “The Philosemitism of G. K. Chesterton,” in William Oddie, ed., The Holiness of G. K. Chesterton (Leominster: Gracewing, 2010),130. 12. Michael Coren, “‘Ludicrous, surreal episode’ against G. K. Chesterton returns,” The B.C. Catholic, 13 September 2013, http://bcc.rcav.org/opinion-and-editorial/3069-canonization-attempt-resurrects-anti-semitic-claim (downloaded 17 September 2013).